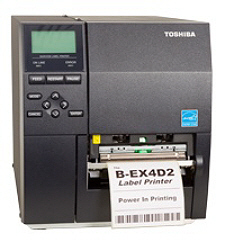 Promoted as “the lowest cost industrial printer solution” the Toshiba Tec B-EX4D2 is an innovative new barcode label printer that certainly has a lot to offer the manufacturing industry. With super fast speeds of 12 ips and a print-head with an expected lifetime of 50km Toshiba designed this B-EX for direct thermal printing applications. The EX high performance series, at a mid-range price point. As with all Toshiba printers they are developed for ease of use and to need as little maintenance as possible. In this way the designers are focusing not on just producing a barcode label printer that does what it should do, but also takes into consideration factors that will enable it to integrate neatly into most working environments. Business managers need printers that will not mean putting out further money and wasting time on training. This series of barcode label printers are very simple to use and maintain. Easy service and maintenance, with snap-in print-heads and field upgradeable options, further lowering the cost of ownership. This printer uses flat head technology, left aligned media and emulation capabilities which also is ideally suited to quick and easy replacement of legacy competitor estates. Toshiba are also keeping to their stated mission of manufacturing commodities that have green issues at its heart. The Toshiba TEC B-EX4D2 barcode label printer comes with the coveted Energy Star programme and a solvent-free ribbon, as well as delivering ‘Carbon Zero’ printing. There is also the energy usage as well which is so important. This model is stated to have the lowest power consumption in the marketplace. The printer comes with free software which includes a network management tool. Whatever your industry this barcode label printer will fit in neatly. Tanto Labels specialise in providing barcode and variable data labelling solutions for businesses large and small. Our strengths are in delivering high quality all varieties of labelling products for Retail and Retail Supply Applications.